What is Apple up to now. The Apple plant at Signal Butte and Elliot has been thru a lot of recreations in the last few years. What is happening now? Apple is seeking permission to conduct “high-tech manufacturing” and to build data-center server gear in a Mesa, Arizona, facility, according to a notice published Monday by the US federal government. A notification published in the Federal Register on Monday said Apple was looking for approval from the Foreign-Trade Zones Board to produce “finished products” in a special zone that exempts it from customs duty payments. “The plant has repurposed the site as a global data command center that will conduct high-tech manufacturing of finished data center cabinets for other data centers,” according to a document filed by Mesa on behalf of Apple in June and made public Monday. The filings come as the company has come under fire by President-elect Donald Trump for producing the iPhone and other popular products overseas. The Arizona effort would mark a rare instance of a US tech company manufacturing and assembling a finished product domestically, where labor costs are higher. Apple’s effort appears limited to equipment for its internal operations, however, rather than for a mass-market consumer product. “The nature of the product is not for end users but for other global data centers what will be supported from the site,” according to the July filing. The servers Apple uses in facilities such as its data centers in Oregon and North Carolina are currently built and tested on-site, according to a person with knowledge of Apple’s data operations. 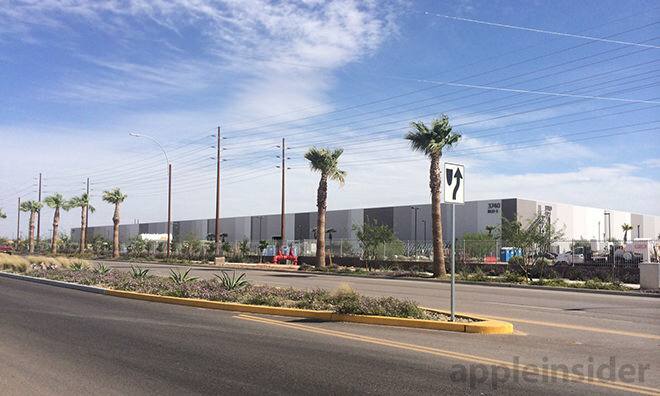 Apple is now moving to consolidate that work in Mesa, where it plans to build and configure its servers before shipping them to other American data centers, the person said. This huge facility in Mesa that was formerly leased to a supplier to build sapphire screen coverings. The facility first applied for and received its special foreign-trade-zone status in March 2014, but the supplier declared bankruptcy before it finished production of the screen coverings. More recently, the facility has been transformed into a “global command center” to store and serve iCloud backups and iTunes. “On its domestic sales, Apple would be able to choose the duty rate during customs entry procedures that applies to finished server assembly cabinets (duty-free) for the foreign-status materials/components noted below and in the existing scope of authority,” the notice continues. “The announcement is consistent with what is planned since 2015. They’re a great community partner, and we’re excited to work with them moving forward,” a Mesa spokesperson told Business Insider. International Trade Administration officials did not immediately return a request for comment. Trump has called several times for the company to assemble its consumer products in the US. 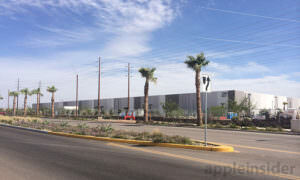 Mesa facility has been called a “global command center” for Apple’s cloud operations. Apple relies on outside vendors for its cloud operations but has been building up the capability to run its own servers at scale in-house, which would mean a significant amount of assembly and construction. The enormous facility, originally intended for manufacturing, is bigger than most data centers. It would make sense as a location for Apple to coordinate building hardware for its data centers. Though the facility will be designed to support Apple’s American data centers, the company has data-center facilities around the world including in both Ireland and Denmark. Apple has been working on projects to design its own servers, The Information reported in March, mostly to ensure that the hardware is secure. Apple reportedly has found that servers it buys off-the-shelf may have had hardware and software added to them to make them vulnerable to infiltration. The company has said it is planning to start with 150 “high-paid” positions at its Mesa “command center,” and the Arizona government has said there are to have a full-time executive working out of the facility. In October, they started hiring services technicians, managers, engineers, and other operations professionals to work at the Arizona facility. Could Climate Change Actually Affect Your Home’s Value? What Happens When You Inherit a House with a Mortgage? Can Someone Under 55 Live in a 55+ Community?